Julia Solomonoff rocks. She’s cool, serious, candid, and it appears like she glides from one great thing to another great thing. At it for many years, Julia has some really beautiful credits. As director, those include, The Last Summer of la Boyita (produced by Almodovar, winner of over twenty international awards) and Hermanas (participant of Sundance and Berlinale Talent Campus labs and premiered at Toronto). As producer, Alejandro Landes’ Cocalero (Sundance 2007), Julia Murat’s Found Memories (Venecia, Toronto, 2011), Ana Piterbarg’s Everybody Has a Plan starring Viggo Mortensen (Toronto 2012), Lucia Murat’s Memories they told me (FIPRESCI winner Moscow 2013) and Celina Murga’s The Third Bank of the River executive produced by Martin Scorsese (Berlin 2014). And, she was 1st AD to The Motorcycle Diaries director Walter Salles. 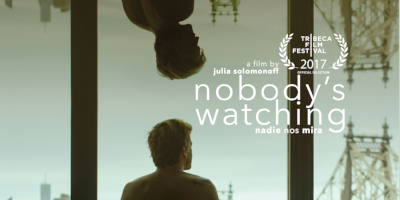 She co-wrote and directed the feature film Nobody’s Watching (nadie nos mira), world premiering at this year’s Tribeca Film Festival in the International Narrative Competition with screenings on the 22, 23, 26 and 27 of April. Spoiler alert: In this episode 43 Julia and I talk film financing, Argentinian women directors, directing from the inside and about Guillermo Pfening, the film’s protagonist and hero. Mr. Pfening (Nico in the film) is a wonderful actor. He delivers a courageous performance that reaches a gamut of difficult emotions with such elegance. It was a pleasure to watch him go at innocence, love, grief, striving, desire, utter destitution and embracing self-reliance. Broke my heart. I’ve seen this story. Nobody’s Watching is a New York story and a world story. After 27-years and counting here in the City, I don’t know of anyone, who has not faced the sun at sunset when all seems lost. But not all is lost. Ja-ja! It ends well... In Spanish we have the verb tenses “ser y estar.” This is the crux of the foundation of the language in its most literal sense, in understanding that distinction of the state of the self. “I am” and “I am” in English is one state. But in Spanish, “ser” (I am) is a permanent state, and “estar” (I am), is transitional. Somewhere in there is the story of us.